Thirteen years ago, in the fall of 2000, the School of Architecture found it necessary to do something it had never done before… conduct a search for a Dean. John Hejduk had been the school’s only dean since it had become independent from the School of Art in 1975. Before that, he had been department Head for 10 years under Esmond Shaw, then Dean of The Cooper Union School of Art and Architecture. For thirty five years, the School of Architecture had challenged the very definition of professional education in architecture, developing an international reputation as one of the most innovative and exciting places to teach and study architecture, with an unparalleled faculty, precisely defined pedagogy, passionate and creative students and most importantly, visionary leadership. It would not be an easy deanship to fill. The School sought someone wholly committed to the discipline of architecture, fiercely intelligent, passionate about the role that architecture could play in culture, society and in the very making of history itself. Someone who could honor the past without being bound by it. Someone who had already made a significant mark in architecture, so that a school so identified with a single individual could be guided toward a future built on its core strengths and collective purpose. Someone with the conviction that architecture, even at its most personal and poetic, could engage and affect the world. The School of Architecture was very fortunate to actually find this second dean. 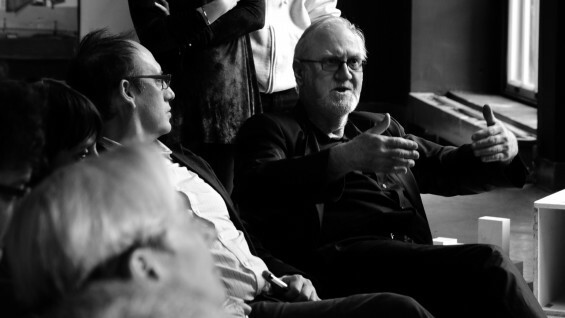 For the past twelve years, Anthony Vidler has engaged and empowered the faculty and students of the school to continue to challenge the very definition of professional education in architecture. He has been an intellectual force and inspiration, teaching required courses such as History of Architecture and Introduction of Urban Histories and Theories, to many seminars that included “Inventing Architectural Modernism, 1945-Present”, “The Critical Edge: Walter Benjamin and the Arts of Modernity” and “Notebooks: Sketching the City”. He has been a rigorous and insightful design critic, from Architectonics through Thesis. He has drawn brilliant new faculty to the school and supported continuing faculty to develop new courses, challenging all to evolve the curriculum, strengthening the school’s commitment to drawing and model making by fostering explorations in the potentials of new computational and digital methods as both analytic and synthetic tools. He has insisted on facing the growing problems of the world, including environmental degradation, sustainability of cultures, civic instability and threats to social justice, through the lens and action of making architecture. He has supported a re-invigorated exhibitions program, including a remarkable exhibition celebrating the history of the school itself on the occasion of The Cooper Union’s sesquicentennial in 2009. He was the resolve behind our new post-professional degree program, integrating this unique program into a unified school with a strong community and sense of identity. And through it all, Dean Vidler has challenged and inspired each of us through his own exceptional creative work. Beautifully conceived books that are a pleasure to read, illuminating lectures, and probing exhibitions. He has been one of the greatest minds and indefatigably creative spirits, and one of the greatest observers and interpreters of architecture for almost 50 years. Through Anthony Vidler's dedication and leadership the School of Architecture today finds itself strong, confident, fiercely relevant, and still the model for the education of architects the world over. Read Anthony Vidler's valedictory interview here.